I've been taking Hydroxycut for about two months. I didn't start riding bike until about 1 1/2 months ago. I was 240 lbs. and now I'm at 208 lbs. I've lost about 32 lbs. At first, it was water weight that I lost. When I started exercising, riding my bike, etc., I could see vast improvement. I only take half of the recommended dosage. I will eventually start weight lifting. Muscletech's Hydroxycut has been around for quite a while now, and many people has had excellent weight loss results. My housemate, some years back, went on Hydroxycut to get ready for summer, the beach, and the ladies. :) He's by no means fat, but had a layer of fat which he wanted to shed to show more definition. After a month or so, by may, he became noticeably more cut and striated. He didn't lose much weight, since we were hitting the gym regularly, but he definitely lost some fat pretty fast. He experience no bad side effects, other than a really fast heart beat. We measured his heart beat at a resting pace, and it was around 90 to 100. One of the most valuable input from Hydroxycut Pro Clinical(and other diet supplements alike) is the motivation they can provide. When you see yourself loosing weight, and start seeing progress, that feeling just can't be beat. Seeing progress is one of the biggest motivators, even long after you're off from Hydroxycut. It sounds swell and all, but like all good things, there's always a downside. You should also know that even though Hydroxycut has worked for so many people, it may not work for you - everyone is different, and it also has its share of potential side effects as well. When you're better informed, you'll be more prepared. I'm 31 years old, 6'3" and was 240lbs at the start. I started taking it just before I workout and it is a great energy booster making me feel like a rock during my workout. I am now doing strength training three days a week and cardio for two days but my cardio is a twice a day program. I rest on Saturdays but on Sundays I run sprints and do body weight exercises. I have lost 30lbs total but I'm sure I have put on between 5-10lbs of muscle and I think that's being modest. Share your reviews of Hydroxycut here. 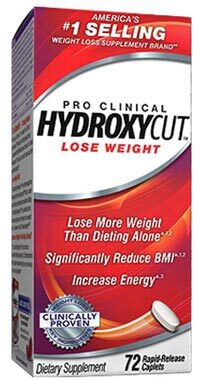 Hydroxycut Pro contains a number of different ingredients including caffeine, acerola concentrate, goji extract,blueberry powder, plus 4 key active ingredients contained in their "Hydroxyprovia" blend. So what's so special about these 4 ingredients? These 4 ingredients have actually been scientifically studied and found to increase thermogenesis by 3 fold! This was stated in a published and peer reviewed study. The study investigated the effects of 4 plants used in traditional Arabic and European herbal medicine (the 4 listed above), and 80 over weight human subjects with a BMI of over 30 took part in this study. The participants were given either a placebo or the mixture of the active ingredients over a period of 3 months. Even though the key active compounds in Pro Clinical Hydroxycut appear to have no side effects as reported by the study, there are other ingredients which can lead to some adverse effects such as caffeine. At the same time, the study with 80 subjects is still a relatively small sample size, so there's no definitive answer on what potential side effects the 4 key ingredients may have. When it comes to using fat burners such as Hydroxycut, you should follow the usage direction carefully, and taking more will not help you lose more weight - it'll only increase your risks for experiencing unwanted side effects. Always start off with a light dose - half of the recommended dosage. This gives you time to discover and assess your tolerance for the diet pill. So don't just rush in. I have taken Hydroxycut for about 2 months now and have noticed a little change. I really don't think that I have lost weight but I feel that I have maybe lost inches in the waist. I have not noticed any increased energy or any changes at all. I do get really tired during the day though and not sure if it could be the pills or if I am just not getting enough sleep. I'm 34 yrs old, 5'9 and started around 178 pounds. I purchased two bottles and just finished the last a couple days ago. My exercise routine is primarily running, Monday through Friday, taking Saturday and Sunday's off. 3 miles for fast workouts and 5 to 7 miles for moderate workouts. I do push ups and ab exercises. Over the course of the 5 and half weeks or so, I've lost about 13 pounds. My waist is down an inch and half or so and I have lost a good deal of fat around the middle. I eat reasonably healthy, keeping junk food, fast food etc... to a minimum, just for a treat every now and then. I drink water regularly through the day but not tons. I haven't had any side effects, I sleep fine, no funny poop stuff... I understand completely that supplements, just like medications, work for some people and not for others. I have zero complaints and would recommend at least giving it a try. If you feel sick or don't sleep or any of the other side effects, just quit, it isn't for everyone. I also think this stuff is a good facilitator, you still have to put in the work. 1. Evid Based Complement Alternat Med. 2011;2011:874538. Epub 2011 Jun 16. Weight loss in animals and humans treated with "weighlevel", a combination of four medicinal plants used in traditional arabic and islamic medicine. Said O, Saad B, Fulder S, Khalil K, Kassis E.
Antaki Center for Herbal Medicine Ltd, Kfar Kana 16930, Israel.